Sam and Kat met as college students, became fast friends, and eventually--under a starry sky--they both confessed deeper feelings for one another and became a couple. Kat recalls that Sam, "told me how he had liked me from the moment he first saw me. From then, it's been a beautiful, unbelievable relationship." In Kat's words: The proposal was so incredible! Throughout our whole relationship, Sammy and I knew we were going to get married. All I asked for in the proposal was that Sammy or someone get a picture. Sammy got several of his best friends involved, half of whom are talented photographers. Sammy began planning the proposal at the beginning of the year, and he was finally ready to propose on April. The original plan was to take me out into these beautiful fields and do astrophotography (photography of the night sky), writing out "will you marry me?" in Christmas lights on a hillside. Sam and his friends could not find enough extension chords, so they had to scrap that idea. They then came up with the idea to use a device called a pixel stick. Harrison (one of Sammy's friends involved in the proposal) owns a pixel stick, which is a pole around 6 or 7 feet long with a strip of LED lights running down it. The lights flash and change colors, and when a long exposure picture is taken, the light will either create a design or write out words or draw a picture. Sammy then hired a friend from our Church, Keith, who majors in graphic design to create a program that would make the pixel stick write out "Will You Marry Me?". Keith did an amazing job! The night before the proposal, Sammy and all the guys drove out to Silverhill Farm to find the perfect location for the proposal. On April 8th, 2017, Sammy took me on a day long date that ended with the proposal. We played around with the pixel stick and did photography for an hour or two, and I was trying to convince myself I would be okay if Sammy didn't propose that day. The last location we went to was a dirt road in the middle of a field. There was the beautiful tree in the background and the night sky was visible all around us. Harrison said he wanted to get a few pictures of the couple, so Sammy and I took our turn in front of the camera. Sam's best friend and best man Alan ran behind us with the pixel stick. Harrison called us over to look at the photo, and when I saw it, I just stared at the picture (shown above) for a solid 20 seconds. I turned around, and there was Sammy down on one knee asking me to marry him! I cried and jumped around, then he put my grandmother's wedding ring on my finger. We then recreated the moment Sammy proposed (we didn't get a picture of the actual proposal, which I have hanging in my room. 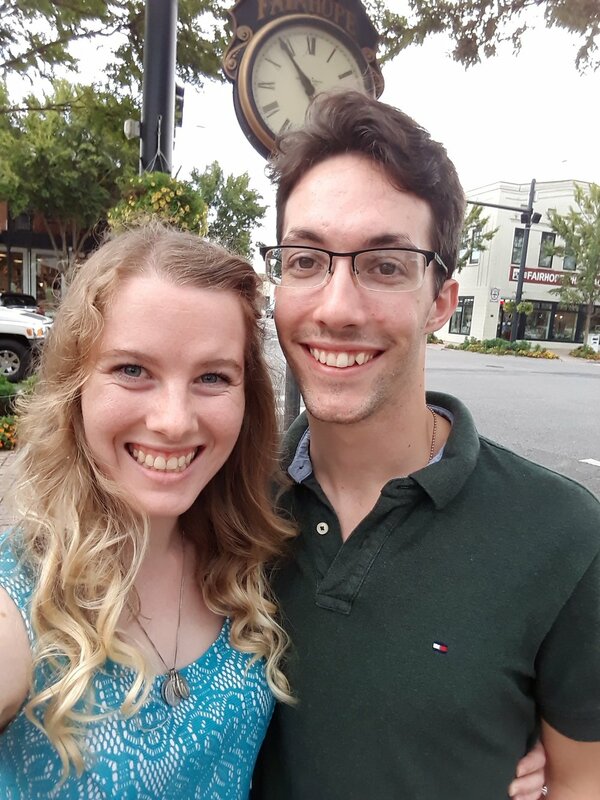 I love Sammy with all my heart, and I absolutely cannot wait to marry him June 23rd (The Feast of the Sacred Heart of Jesus), 2018!